Yeah…charting fundamentalists… ggplot, which is probably the best charting package for the R statistical package, disallows separate left-right axes (without crazy workarounds). You ask how to do it, the creator says it’s a bad practice. I know why it can be misleading, but I can read an axis, and sometimes I just want to do a quick and dirty comparison of how two things move together. It’s like grammar nazis, the only way a language can evolve is by having a little flexibility…if people want to break rules, it’s for a reason, and if something is awkward or unclear, evolve new rules to make it clear. (Kind of a metaphor for using R, if someone has a package to do what you need, it’s amazing, otherwise you’re in a world of s***, but I digress). i suggest reading Stephen Few’s books. He has a thoughtful breakdown of when a zero base is or isn’t required. For example, bar charts use length to covey the message, so shortening the length artificially results in a different message. 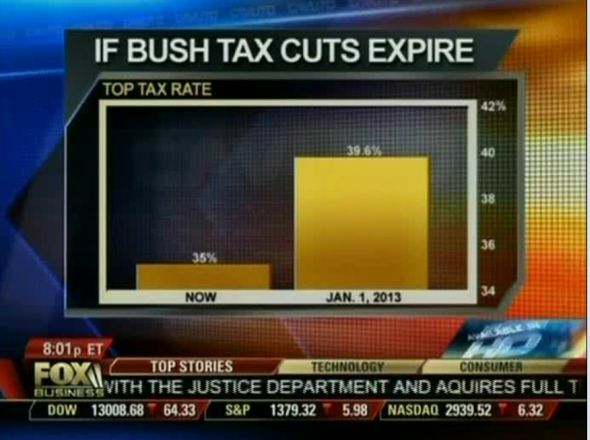 Note that the Fox chart is a bar chart. I may be mentally impaired from years of drug use as a young man, but I think you’re on safe ground not zeroing in. However it’s possible there’s a y-axis hiding under your bed waiting until you drift into sweet sleep, at which point it will bludgeon you with null values. Most people agree that the axis shouldn’t be broken in a bar chart, so I’ll not discuss them. In a line chart what matters is the slope, and you can change it by breaking the axis or by changing the aspect ratio. So, there is no “right” slope. That’s why you should always have at least two series, and read the chart by comparing the slopes. If you are using large numbers, change tends to be small (GDP, for example) and that forces you to break the axis to improve resolution. That’s what happens here, and it is not the right solution. The right solution is to display rates of change in a bar chart. You would have the best of both worlds: an unbroken axis and the precipitous decline. I’m not one of the “y axis zero fundamentalists”, but I believe that zero should be our default origin and that there must be a very good reason to break the axis. If you get a flat line you’re probably using the wrong measure. I strongly disagree with the idea of “start with as few data points as possible then add as necessary.” Use all the data. I think it’s acceptable to make line charts (but not bar charts) that don’t start at zero, however, the more general rule is to not mislead the reader. I think some subtle tweaks could help this chart avoid doing that (I didn’t notice the truncated scale the first time I saw it). First, the line begins at the x-axis, implying that it starts from zero. Second, the vertical distance from the x-axis to 40k (those ticks are too precise, btw) is exactly the same as from 40k to 42k. If the difference was 1.5 times, then that would be a visual cue that something was different. The are more advanced ways to handle this, e.g. have the scale indicate peak values rather than regular intervals, but if the x-axis had been placed a quarter inch further down we probably wouldn’t be having this discussion. This was exactly my thought. The horizontal axis is a dark line, and the plotted data starts exactly on this line. Further, the vertical axis is not labeled at its minimum, so it looks like the convention of using a hyphen rather than an actual zero (fine in a worksheet, but a bad practice on a chart). Fix these, and confusion is minimized. I really like the removal/diminishment of the horizontal axis as a way to remove one of those metaphorical cues. But I would stick to my idea of showing just a few points, here’s why: The story we’re trying to tell is exactly as Justin describes: a precipitous drop off in the last three years has erased all the gains since 1974. So then I ask myself if I need data from 1987, 88, 89 etc. to tell that story. Probably not. More and more I find myself not starting with the data I have and plotting all of it but first asking, what am I trying to say and seeing how simply I can say it. No right or wrong here but lots of possible approaches. Good ideas both of you. This is actually in reply to sberinato, whose comment I can’t reply to for some reason. I disagree with your use of only a few data points. By doing this you’ve decided what interpretation should be put on the data. Honest visualisations allow the viewer to interpret the message by making it clear. If there was some gain to leaving off the rest of the data you may have a point, but what does it cost you to have all of the data and therefore a more accurate chart? Not bandwidth, nor physical space within the graph. Nothing that I can think of. Put it all in and show the user that the increase between 1974 and 2010 was sporadic, not consistent. By choosing which data you put on the chart you apply your own priorities to the result. I also disagree strongly with only showing three points. Do you then compress the X axis? That would just look like a line segment going up and another going down. Show the data you have. If it shows what you wanted to remove points to show, ithen you’re showing what you wanted to show. If it doesn’t, then removing points is probably lying. Another way to solve the issue is to normalize the data to either a starting point like 1970. Or use a mean or average. Which is good because for organizations the percentage drop is far more significant than raw numbers. A lot of housing price data is presented that way, especially when aggregated. Unambiguously shows the 32% drop in three years. I like this as well, though for a broad magazine audience I wonder if adding a calculation helps or hinders? Housing data is done this way for people who use housing data all the time, that makes sense to me. Do most readers of Businessweek deal with normalized scales? Maybe, but it’s something to consider when making the decision. Of course you dont need to slavishly scale the y axis from 0. The answer is – it depends. Relatively small changes in relatively large figures can mean a lot and these get lost when following the fundamentalist line. It really depends upon the magnitude of what you are trying to observe. I can’t seem to reply to Tim Smith and Jon Peltier directly but this is in response to them. My idea on the three points was to *start* there, and depending on your audience that may be enough. Or you may add more. If you are trying to show that “Enrollment rose steadily for four decades then dropped precipitously in three years” you can show that with just three data points. You may even opt for a simple table. If that is not enough to tell the story you want to, then you explore alternatives. You state “by doing this you’ve decided what interpretation to put on the data.” I agree with you. But that’s why we’re here, to put an interpretation on the data. Every visual abstraction is an intepretation of the data. It’s a matter of knowing your audience. So I ask myself, what are the consequences of my audience not seeing the undulating bumps between ’74 and ’10? Do they need to? Does it help tell my story? If it doesn’t I can simplify. In this case, thinking about a general news audience, it may help to include every year’s plot (no right answer here) but if you do, I think the axis has to be set to 0, possibly with a zoom in to create that downward slope that’s so dramatic, but which shouldn’t stand on it’s own. Very good discussion here. Thanks. Is it possible that showing all of the data provides better context for the alarming drop at the end? I’d argue that the data between 1974 and 2010 does aid the story because it illustrates how the last 3 years have been a dramatic departure from the historical trend. @skokenes – I wrote and posted my reply before I saw yours. I think we’ve agreed on the same points regarding the omitted data points. Depending on your audience, showing just three points can be a disaster. To me, a line chart with three points at 1974, 2010, and 2013 would look like the chart was created or the data collected in a very lazy fashion. Why such a large gap between the first two points? Was it really a nice steady rise followed by a faster steady decline? Showing all the points show me that it was a more typical up and down behavior trending upwards, with every year accounted for and a resolution much smaller than the overall magnitude of the chart. The decline was much more sudden, with three straight years showing very similar declines. On another note, I prefer a line chart to actually show a marker for each discrete data point. This way I can see if there were any missing years, and if the author of the chart also committed the sin of smoothing the lines, I can see where the data came from that resulted in the smoothed line. Scott, I think we have a fundamental difference in our approach and what we want to achieve. You seem to be taking a journalist’s approach by wanting to ‘tell your story’. That’s fair enough for journalists, but if you’re trying to present an objective chart and let the data tell the story, you’ll need to keep your own interpretation in check. skokenes has nicely articulated the reasons why three points don’t tell the whole story in this particular case, so I won’t repeat it. If you *start* with three data points and then put the rest of them in, we’re on the same page. If you start with three and leave it at three, you’ve told your story, not the story in the data. I agree with your overall point that whether or not to include zero on the y-axis depends on the goal of the visualization. If the story here is that all of the law-school enrollment gains since 1974 have been wiped out in two years, a relative scale is fine. 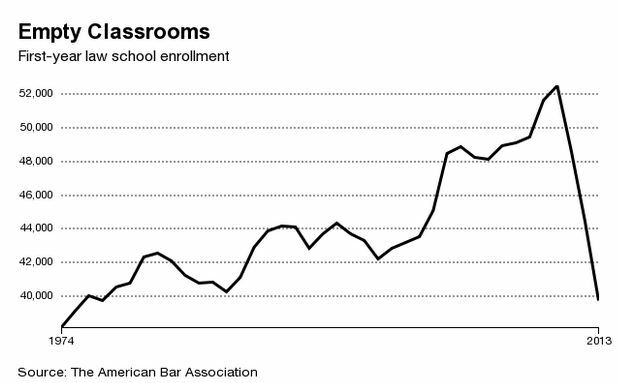 But to assess the impact on law schools themselves (“Empty Classrooms!”) we need to see how large that change is in comparison to total enrollment. For that I think having a zeroed axis helps. Yes, I’d noticed the inaccuracies in Abhinav’s chart too, so thanks for taking the time to do an accurate version. Your chart shows the sharp decline clearly. Justin’s original chart exaggerates the decline, especially given that he starts the line on the bottom of the chart where there’s no label on the y-axis. To judge by his reaction on this page, he doesn’t like being asked to have his y-axis go to zero because it makes his chart look less dramatic. The decline is dramatic enough without having to be embellished in the way that Justin has. I agree that there are times when you don’t need to have your y-axis go all the way to zero. It’s just that this isn’t one of them. Calling people fundamentalists doesn’t change this. Whoops, I’ve been inaccurate myself. Justin didn’t create the chart in question, so apologies to him for my accusation of embellishment. Nonetheless, I still think he dislikes the versions with a y-axis that goes to zero because they reduce the drama. He state’s that Abhinav’s chart ‘is less informative than the original chart’ but to me Eric B’s accurate version is clearly more informative than the original. I think I like Eric B.’s 1947-2013 chart (https://twitter.com/ebellm/status/545332031589085184/photo/1) best of all. It tells the whole story (or at least the wholest story available), yet it’s still pretty simple and clear. Yep, I agree that the full 1947-2013 version is the best. It’s interesting that the original author chose 1974 as the starting point. It conveniently starts just below the 2013 level and leaves out the equally precipitous increase between 1968 and 1971. Taken together with the ‘Empty Classrooms’ headline, it looks a little manipulative. No, maybe Scott’s right. If we cut out unimportant data points, we see that law school enrolment has grown dramatically, from 18,582 in 1947 to 39,675 in 2013, and amazing 113.5% increase. you can always truncate the axis on your graph using something like GIMP, simply select the x-axis then cut and paste it closer to your data along the y.
LOL! That’s because there is no “precipitousness”. If you saw the second chart first, you would more accurately be telling us how the no-zero chart manufactured a false “precipitousness”. This issue came up in a class I taught this Fall. The text book we used condemned the use of broken axis graphs. However, one of my students made a convincing case that, under some circumstances, you might be more interested in the fluctuations highlighted by the broken axis graphs, and, thus, justified in using them. It’s not a recent thing; it goes back to a classic that all should read, Darrell Huff’s _How to Lie With Statistics_, which came out in 1954. But Tufte refers to Huff’s book in the quote above — and says it’s wrong about y-axes needing to go to zero.